"For the first time ever, coaches, umpires and baseball fans can test their baseball rules knowledge at the ball park or on the go," said David Yorke, co-founder and CEO, Umpires Media Inc. "We're very excited to bring a great mobile entertainment experience to BlackBerry® smartphone users so they can learn more about the rules of a sport they know and love." 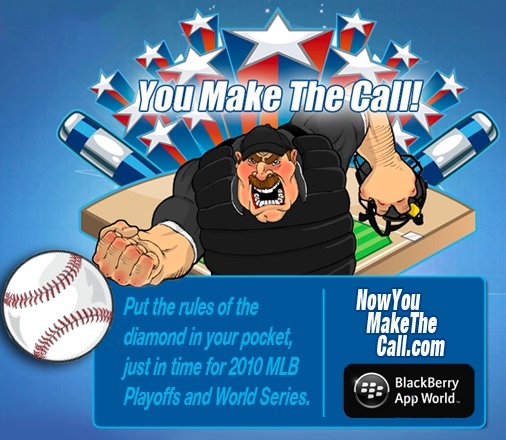 You Make The Call features a series of video challenges with three possible answers that users have 10 seconds to answer. Answers and explanations are provided and the key elements of play are reviewed. Players can win points for correct answers, see where they stand against other competitors and challenge a friend to match or better their score. Having checked it out for the past mins before posting, it's pretty awesome. One thing to note though is that it is a fairly big application. It weighs in at 5.8MB. Still, well worth it for the fun and if you're slack on baseball knowledge it's a must have. Also, BlackBerry Torch 9800 users will have some troubles, it doesn't look to be compatible at this time. If you have issues on other devices be sure to comment, some folks are having issues with getting it to load correctly for them. I had to adjust the permissons to all say allow.